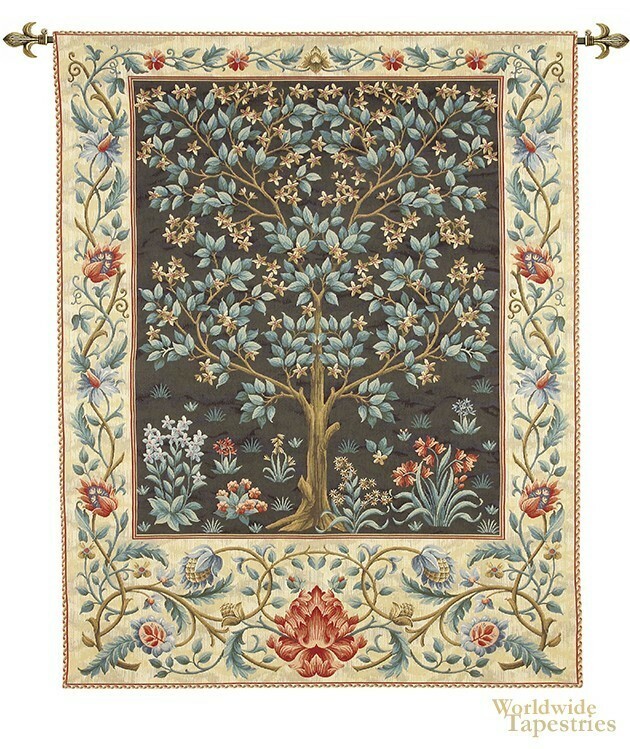 This gorgeous tapestry of the Tree of Life is based by the rich design of Morris and Co from the 19th century. In this tree of life tapestry we a work inspired by William Morris (1834-1896) and John Henry Dearle (1860-1932), from around 1910. The detail in this work is impressive as is the color balance and the balance of light and dark tones. The dark brown background compliment the blue green leaves and the cream flowers of the tree superbly. The border of acorn like flowers of again the sophisticated blue green and yellow, and sienna red large blooms compliment the central theme very well. The tree is a representation of the immortal tree of the garden of Eden, or the amazing power of nature that permeates life. Note: tapestry rods and tassels, where pictured are purchased separately. This item ships from the United Kingdom (Europe). Dimensions: W 19" x H 27"
Dimensions: W 28" x H 36"
Dimensions: W 36" x H 56"
Dimensions: W 56" x H 71"